I’m often asked about “world building,” the term for creating the environment for fantasy novels. Most tend to be much more elaborate than mine, which may be one reason why my books are so much shorter. I usually respond with some variation of, “I’m more interested in people building,” which is true but can understandably sound a bit facile. Still, I can’t deny I’m far more interested in the details of character than in aspects of society that don’t impinge on the story. 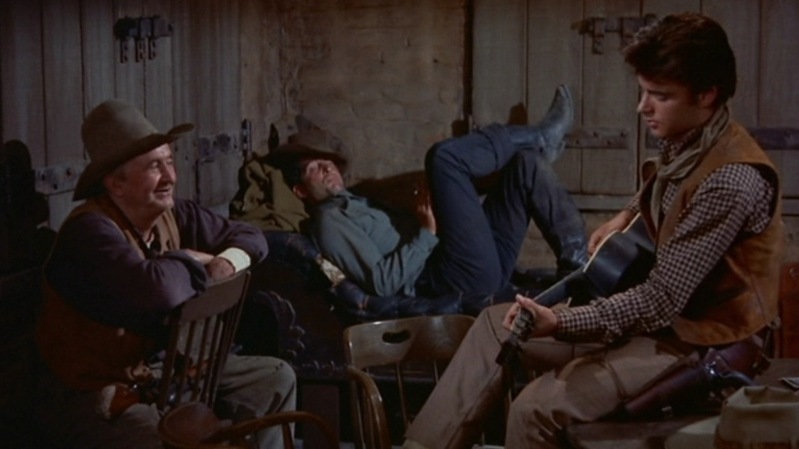 So I cast about for another example of that approach, and found it in one of my favorite movies, Howard Hawks’ classic western Rio Bravo starring John Wayne, Dean Martin and Ricky Nelson. The setting is as generic a Western town as you can imagine: it’s nameless (although it’s assumed to be “Rio Bravo,” no one ever actually says so), isolated, and the only institutions shown are the jail, the hotel and the saloon. Contrast this to the unique, incredibly detailed sets of The Wild Bunch or the specific geographical settings of The Searchers. At the time (1959) television was filled with Western series the way we now have reality shows, and nothing about Rio Bravo’s setting is substantially different from the backlot towns people saw every week for free on Bonanza, Gunsmoke and Have Gun, Will Travel. So what did the movie have to make them pay to see it? Characters. Archetypal to be sure, but developed with detail and skill, played by actors at the top of their games and laced through with humor. In other words, the exact opposite of world-building. People-building. And if I have to err, that’s the direction I’d rather go. I can live with an underdeveloped or generic setting, as long as it’s populated by compelling and interesting characters. What do you think? How much setting is enough, and how much is too much? Admit it: this picture really makes you want to see the movie, doesn’t it? I think there is an assumed world with the genre westerns of this era. And unlike the movies you mentioned in comparison (especially The Searchers) there is no real deviation from that 'type'. The Searchers, or Unforgiven, or Dances With Wolves, all buck against the 'accepted' stereotype of the western. So they need Audience 'instruction". Or Greater World Building. I am going out on a limb here. I think you are pointing out an important element in all the stories I enjoy reading: character development. This being done through the interactions of the protagonist(s) and other characters to show initial personality and how these characters develop after their experience. If a character does not 'develop' but remains stagnate then the character loses what makes it interesting to the reader. John Wayne heroes were of a certain type. They were rough, tough, Alpha males. But in the movies that he received the greatest 'credit', his characters changed the most. I think of the Shootist, which takes that stereotype and turns it on its ear. I'm going to go to an RPG place, but bear with me. The part of RPGs I like is making a character that I'll enjoy playing. I often do outrageous accents (I'm playing a French demolitions expert right now – I want you to imagine this). The world the DM has created is ancillary to the character and story. Mind you, I appreciate when a DM goes to the trouble of creating an interesting and detailed world for me to play in, but I'm much more interested in the story and the interaction between characters. I take a similar approach when writing fiction (oh yes, all my published works! Haha!). If it's fun for me to put myself in the mind of the character who is moving through the setting and story, it'll be fun to write and, hopefully, fun to read. 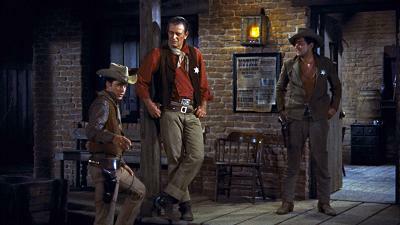 Love "Rio Bravo!" But back on topic…I think, ideally, the worldbuilding is revealed through the character building. Not just the physical world settings as the character interprets them, but the worldbuilding of how magic works, or what political structures are in place.